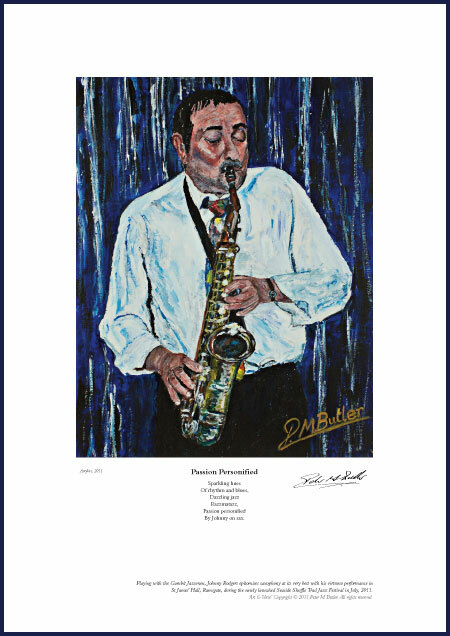 My jazz painting and portrait of Johnny Rodgers captures him playing with the Gambit Jazzmen in St James’ Hall, Ramsgate, during the Seaside Shuffle Trad Jazz Festival in July, 2011. Johnny epitomises saxophony at its very best with his virtuoso performances. 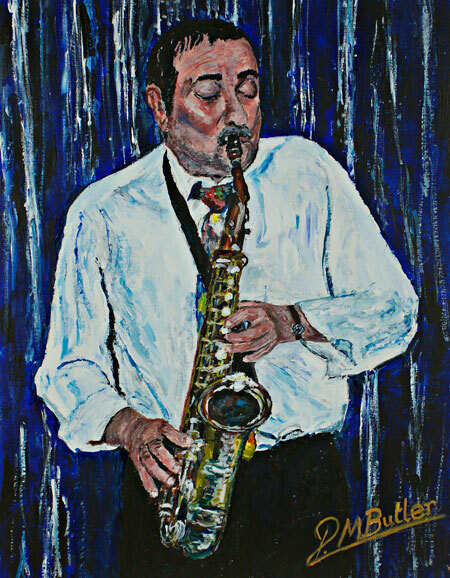 A very personable musician, Johnny is a favourite of jazz fans wherever he stars whether playing sax or clarinet and I was delighted when requested to paint his jazz portrait. Just opened an email from Pete Lay informing us of the very sad news that Johnny Rodgers passed away yesterday, sunday 3rd January, 2016. You may have been informed already, but we felt that as many people/friends as possible would like to be informed. Just heard today of the very sad loss of a brilliant jazz musician and one of the most personable guys on the circuit. All our condolences to Kathy and family. No doubt he will be playing with his mate Dave Waskett in the Heavenly Jazz Club. In the good old days of the 1066 Jazz Club.